New Ship Igloo & the Penguin Games! Yeah!! There are some great cool stuffs in Club Penguin today!! Also, there are some cool clothing items in the Sports Catalog which is based on the coming Penguin Games!! Also, the new Ship Igloo will be coming very soon and by the look of it, it will be be a very new and nice igloo design!! There is also a special article about tips on Fashion which helps your penguin to look better!! And Club Penguin’s current “In Focus” is on the Plaza, a really cool place in Club Penguin!! Woot!! Here is a post dedicated to finding Rockhopper!! 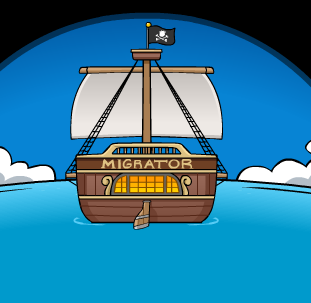 Basically, you just look at the tracker to get the current location of Rockhopper!! Also, Rockhopper has just docked at the Beach!! I hope you get to meet him and get some awesome freebies from him!! : ) Thanks a lot!! There are 8 paper boats to find!! The first one is at the Mine on the water bucket! The second paper boat is at the Cove on the bottom right of the screen!! The fourth paper boat is hiding among the rocks at the Beach!! The sixth paper boat is at the Puffle Shop near the Puffle Food!! The second last one is at the Dock and is hidden there!! Arrange the pieces of the blueprint so that they look like the one as shown in the picture!! Also, Rockhopper has just landed at the Beach!! You can get a free Brown Boots and buy some new furniture items!! : ) One of the hidden cheats in this catalog is that you can buy a Life Ring by clicking on the image of the Steering Wheel!! : D Thanks a lot to Peng Pinky for this great tip!! In addition, there is a new play at the Stage which is called Team Blue’s Rally 2!! The play looks very awesome with two teams, the Red and Blue Teams!! You can get to buy a free cool Gym Background which is part of the new Costume Catalog!! Also, Club Penguin’s current “In Focus” is on Jet Pack Adventure which is packed with hints and tips about the game!! Also, there is an article on the new Play that is coming to the Stage very soon! !